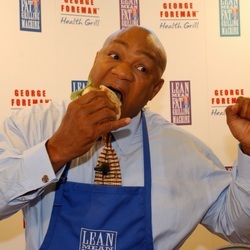 George Foreman net worth: George Foreman is a retired American boxer and highly successful entrepreneur who has a net worth of $300 million. George Foreman has the net worth of a champ but you'd be surprised to learn how little of his fortune actually comes from boxing. In fact after turning professional in 1969 and stacking up an impressive career of 76 wins out of 81 fights, by the 1980s Foreman had a relatively small net worth of $5 million. Fortunately, thanks to a very popular grill that bears his name, Foreman is a very wealthy man today. 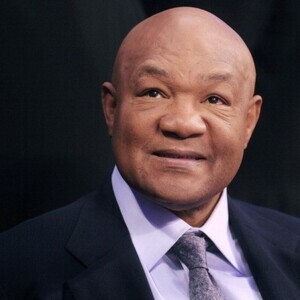 A two-time World Heavyweight Boxing Champion, Olympic Gold Medalist, multimillionaire entrepreneur and born-again Christian minister, George Foreman represents an amazing story of success and perseverance. Unfortunately by 1987 nearly all of that $5 million fortune from boxing was gone through bad investments and an overly extravagant lifestyle. George was literally on the verge of total bankruptcy, in a recent interview he was quoted as saying; "It was that scary because you hear about people being homeless and I was only fractions, fractions from being homeless." So Foreman started boxing again, staging an impressive comeback that lasted into the late 1990s after he had also become a boxing commentator for HBO. The name George Foreman means different things to different generations. 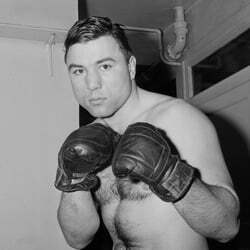 Some folks will recall the young 24-year old Texan who delivered a TKO to the undefeated Smokin' Joe Frazier in 1973. The same fighter whose first defeat was to Muhammad Ali in the 1974 Rumble in the Jungle. The Rumble was a historic battle that took place in Zaire and became the subject of the Oscar-winning documentary When We Were Kings. 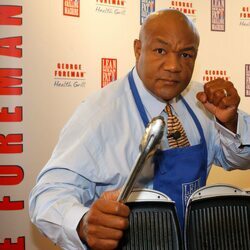 If you are younger, George Foreman is probably better known as that jolly guy on TV who sells Meineke mufflers and the George Foreman Lean Mean Fat Reducing Grilling Machine. His hard work pays for a 40 acre estate in Texas where he lives with his fifth wife Mary Joan and several of his ten kids. All five of his sons are named George Edward Foreman and his daughters have George as a middle name (except for one daughter named Georgetta). Foreman has insisted that all of his children obtain a college degree, but that hasn't stopped a few of them from hopping in the boxing ring, diploma in hand. George III is following in his father's boxing footsteps by recently winning his first professional boxing match. 31 year-old daughter Freeda had a brief career trading jabs, with a record of 4-1. Daughter Natalie has taken a different path and is an aspiring singer. While his brood is busy building careers of their own, papa George continues to find new ways to grow his empire. He's currently a partner in the Panther Racing Indy Car team. He has authored five books and he still makes the occasional appearance on TV (guest on The 700 Club, judge on the American Inventor) and film (cameo in Night at the Museum: Battle of the Smithsonian).